We've been making a lot of progress on Havencall as we crunch to finish the first world in time for IndieCade's late submission deadline. Erithos, Aura's hometown and the first town in the game, is complete, and Carathos, the second town, is getting close. Additionally, the first puzzle, where Aura learns Space/Time magic, is also complete. However, the closer we get to finishing the first world, the more we realize we still need to do! As is often the case, that last 10% seems to have no end - but as we get closer, Havencall starts to feel like an actual game, and is actually fun! All of the user interface components, like the dialogue system and inventory, are also finished. Don't be fooled when I say there's an inventory though - there are only two items you can pick up, and neither one is necessary to complete the game! You say you want some more? Well I'm not surprised, but you'll have to wait until we make an actual trailer for the first world! In other news, we've decided that we do want voice acting in Havencall. The dialogue system already supports voice acting, however we wont have time to record anything until after the IndieCade submission deadline. I also set up everything needed to support multiple languages (both text and voice acting). While we haven't decided yet what languages other than English we'll add to the game, it is now easy to do (translating an xml file for the text, and recording new audio files for voice acting - although languages can be text only). If anyone wants to help out translating the game or suggest what languages they want to see Havencall in, feel free to post a comment here! Finally, we created a new tool to quickly put together scenes called the Scene Editor! 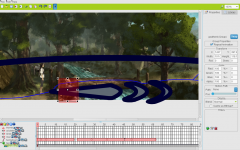 The scene editor was created by hacking VIDE to create a program that could manage multiple VIDE files, motion paths, sound effects and clickable areas to create an entire scene. While the code may have been rushed and ugly, it is functional, and has helped streamline scene creation greatly. The blue oval in the above image is actually the river sound effect in game, and while I usually keep them hidden, they show where the river can be heard. The movement path also allows me to easily set what scale Aura should be (and what layer she should be in), making it a LOT easier to have her shrink into the distance or walk behind a bush. Anyways, that's all for this update! Wish us luck as we crunch towards the IndieCade deadline, and I've probably already used up too much time writing this news post, so I'm off!